A vomitorium is a passage situated below or behind a tier of seats in an amphitheatre or a stadium, through which big crowds can exit rapidly at the end of a performance. They can also be pathways for actors to enter and leave stage. The Latin word vomitorium, plural vomitoria, derives from the verb vomō, vomere, "to spew forth". In ancient Roman architecture, vomitoria were designed to provide rapid egress for large crowds at amphitheatres and stadia, as they do in modern sports stadia and large theatres. Smock Alley Theatre in Temple Bar Dublin has two vomitoria, one stage left and one stage right. The Oregon Shakespeare Festival, for instance, has vomitoria in two of its theatres, the outdoor Elizabethan Stage and the Angus Bowmer Theatre. The voms, as they are called, allow actors to mount the stage from halls cut into the amphitheatre. The Guthrie Theatre in Minneapolis, Minnesota has two permanent vomitoria, one at stage left and one at stage right, of its thrust stage. The Circle in the Square Theatre, designed to reflect the theatres of ancient Greece and Rome, is the only Broadway theatre that has a vomitorium. 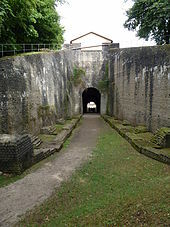 The vomitorium is still used in many of their productions as an entrance and exit for the actors. The Cockpit Theatre, built in London in the 1960s, is one of the very few purpose-built theatres in the round in London, and features four vomitoria as corner entrances between four banks of raked seating arranged in a square. The Chichester Festival Theatre, founded in 1962, was the first of its kind to be opened in the UK for 500 years, because there is no proscenium arch or wings. Instead the stage is a thrust with vomitaria or "voms" for the audience and performers to enter and exit. In addition the Mark Taper Forum, one of the three theatres making up the Los Angeles Music Center, has two vomitoria. It has a strong thrust stage such that the audience sit in an amphitheatre-type array. Winnipeg's second largest theatre, Prairie Theatre Exchange, has two vomitoria on either side of their thrust stage, with seating on three sides. The Denver Center for the Performing Arts' Space Theatre is a theatre "in the round" with a pentagon configuration. It contains five vomitoria spaced 72 degrees apart, creating five equal seating sections. There is a common misconception that ancient Romans designated spaces called vomitoria for the purpose of actual vomiting, as part of a binge and purge cycle. According to Cicero, Julius Caesar once escaped an assassination attempt because he felt ill after dinner. Instead of going to the latrine, where his assassins were waiting for him, he went to his bedroom and avoided assassination. This may be the origin of the misconception. The actual term vomitorium does not appear until the 4th century CE, about 400 years after Caesar and Cicero. ^ "Vomitorium". Oxford Dictionary. Oxford Dictionaries. Retrieved 2 December 2010. ^ Longfellow, William P.P., ed. (1903). A cyclopaedia of works of architecture in Italy, Greece, and the Levant. New York: Charles Scribner's Sons. p. xxxii. ^ "Friday Night Is Music Night". BBC Press Office. 26 January 2016. Retrieved 5 February 2018. ^ Radin, Alice P. (8 January 2003). "Fictitious facts: The case of the vomitorium". APAClassics.org. American Philological Association. Archived from the original on 2003-03-20. ^ Anna (May 8, 2005). "Roman Vomit Collectors". Fascinating History blog. ^ McKeown, J.C. (2010). A Cabinet of Roman Curiosities: Strange Tales and Surprising Facts from the World’s Greatest Empire. Oxford University Press. pp. 153–154. ISBN 978-0-19-539375-0. Wikimedia Commons has media related to Vomitorium.